This post is far different from my normal D&D fare. I am participating in the Game Night Blog Carnival, along with several other RPG blogs. The intent is to discuss non-RPG games, whether they are board games, card games, or whatever. After all, some nights, you can’t get the entire party together; why not play a board game instead? In the past couple years, I have rediscovered the appeal of tabletop games. There are so many fantastic board and card games out there, far beyond the limited appeal of Monopoly and Yahtzee. 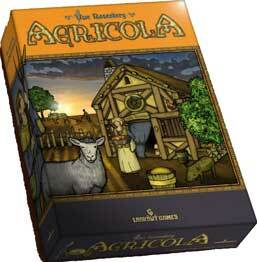 One of my absolute favorites is Agricola, named after the Latin word for “farmer”. It is highly strategic, yet accessible, and chock full of significant decisions, with very few random elements. My family and I are hooked, and have played it regularly in the three months since we purchased it. 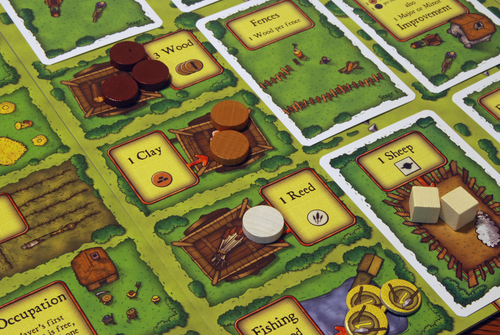 In Agricola, players take on the role of a family of farmers, struggling to live off the land. You begin the game with two family members and a small wood hut on a modest-sized piece of land. The object of the game is to expand your home and your family to create a farm that is varied and successful, but still able to make enough food for your growing family. Along the way, you will plant crops, raise animals, build improvements, and perhaps even take on different occupations. Planning the elements of a balanced farm while making sure your farmers’ bellies are always full is a delightful challenge. The game takes place in rounds, where each player places a farmer (represented by a colored wooden disk) on an action space. Each space has a different effect, ranging from collecting resources to improving the farm or even going fishing! Wood, clay, stone, and reed can all be collected, and are used in various projects. Wood is needed for fences and stables, clay is necessary for fireplaces and ovens, and reed is required for roofing your hut. You can also plow fields, plant grain or vegetables, and even raise sheep, boars, or cattle. As the game progresses, different actions become available, some of which might add family members to your household or improve the material of your hut. Choosing the right actions at the best time is a key to success. Periodically throughout play comes the harvest phase. Here, your various efforts are rewarded. Planted crops yield their bounty, and animals breed after their own kind. But this is also when your family must be fed, each member requiring two food. Hopefully, you have planned for this, perhaps by baking grain into bread, or cooking up some nice lamb chops. Even fishing at the pond can help feed your hungry workers, if you plan ahead of time. If you lack enough food to live off of, you can beg to survive, but this costs you points that are desperately needed to win the game. After fifteen rounds, the last harvest time progresses, and scoring begins. Having a good variety in your farm is essential, since you lose points for missing staples, like grain, stables, or boars, for instance. A bigger family living in a sturdy stone home will earn more than a small group in a tiny wood hut. A herd of cows is worth more than a similar number of sheep. Once all the points are tallied, the player with the most is declared the winner. Agricola is a visually appealing game, with colorful boards for each player. The graphic design is clean and cartoon-like, easy to read and fun to play with. Tangible bits like the wooden fence pieces or the various tokens representing resources will delight fiddly players. After only a few sessions of play, we splurged and purchased a set of wooden tokens for use with Agricola, including adorable animals, tiny wooden drumsticks, and minuscule stacks of wood. These tokens really add to the experience, in my opinion, and though they aren’t strictly necessary, they add much to the game’s already considerable charm. 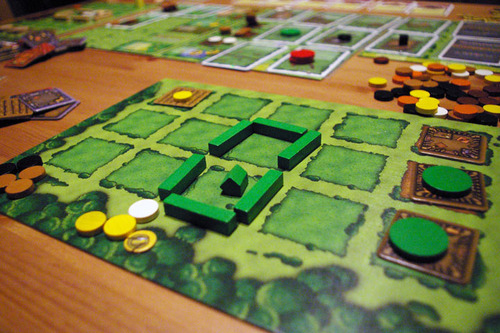 One of Agricola’s greatest strengths is the fact that it has multiple levels of complexity. A simple version of the game, without occupation and minor improvement cards, is an excellent entry point for starting players. This so-called “family” version is totally balanced, with no random factors at all, which might cause some players to prefer it all the time. Adding in the various decks of improvement and occupation cards adds to the number of choices players have, which effects playing time, as well. These decks of cards, three of which are included in the base game, make the game even more replayable. Several expansions and new decks of cards are also available, giving Agricola incredible staying power as a game you will want to play for years to come. I highly recommend Agricola to anyone with even a passing interest in gaming. The various systems of the game are intriguing, and the component quality is top notch. The high degree of flexibility is another major benefit. It turns out that taking on the role of a simple farmer, trying to make the most of a modest farm, is a great way to spend some time. The next time your entire D&D group isn’t available, open up Agricola and see what you think. I doubt you will be disappointed!